Articular cartilage has a limited capacity to repair following injury. Early intervention is required to prevent progression of focal traumatic chondral and osteochondral defects to advanced cartilage degeneration and osteoarthritis. Novel cell-based tissue engineering techniques have been proposed with the goal of resurfacing defects with bioengineered tissue that recapitulates the properties of hyaline cartilage and integrates into native tissue. Transplantation of mesenchymal stem cells (MSCs) is a promising strategy given the high proliferative capacity of MSCs and their potential to differentiate into cartilage-producing cells - chondrocytes. MSCs are historically harvested through bone marrow aspiration, which does not require invasive surgical intervention or cartilage extraction from other sites as required by other cell-based strategies. Biomaterial matrices are commonly used in conjunction with MSCs to aid cell delivery and support chondrogenic differentiation, functional extracellular matrix formation and three-dimensional tissue development. A number of specific transplantation protocols have successfully resurfaced articular cartilage in animals and humans to date. In the clinical literature, MSC-seeded scaffolds have filled a majority of defects with integrated hyaline-like cartilage repair tissue based on arthroscopic, histologic and imaging assessment. Positive functional outcomes have been reported at 12 to 48 months post-implantation, but future work is required to assess long-term outcomes with respect to other treatment modalities. Despite relatively positive outcomes, further investigation is required to establish a consensus on techniques for treatment of chondral and osteochondral defects with respect to cell source, isolation and expansion, implantation density, in vitro precultivation, and scaffold composition. This will allow for further optimization of MSC proliferation, chondrogenic differentiation, bioengineered cartilage integration, and clinical outcome. Articular cartilage (AC) injury following joint trauma is a major risk factor for the development of osteoarthritis (OA), a condition that results in significant patient morbidity and substantial cost to healthcare systems -. Approximately 10 to 25% of the population suffers from OA, with increased prevalence noted in older age groups ,. OA is irreversible and eventually requires joint replacement for alleviation of pain and restoration of function as it progresses to end-stage disease. Due to the limited capacity of AC to repair, early intervention is required to prevent progression to OA . Effective management options are limited at present, resulting in a drive to develop novel tissue engineering techniques to resurface AC defects . Current treatment modalities aim to restore AC through primary repair, stimulation of adjacent tissue and graft implantation. Primary repair involves rigid fixation of osteochondral fractures in an acute setting . Microfracture and subchondral drilling breach subchondral bone to allow migration of cells and chemical mediators into defects . Although this leads to defect filling with repair tissue that is predominantly fibrocartilage , reasonable results can be obtained in the short- to intermediate-term with proper rehabilitation ,. Osteochondral autologous transplantation and mosaicplasty are performed through transplanting one or more osteochondral autografts from healthy, non-weight-bearing surfaces . Although intermediate-term outcomes have been positive, outcomes are variable over longer periods of time ,. Furthermore, donor site morbidity is the major downside of this technique . Allogeneic transplantation is an alternative strategy that allows for resurfacing of large osteochondral defects. Fresh allografts stored at 4°C provide good clinical outcomes , but are logistically difficult given the need for donor-recipient size matching, testing for infectious diseases and implantation within a short time frame to ensure chondrocyte viability . Freezing of tissue allows for longer-term storage, but outcomes deteriorate quickly following implantation of frozen allografts . However, cryopreservation could be a suitable alternative in the future given the establishment of vitrification protocols that have yielded promising results . Bioengineered scaffolds implanted alone, or in conjunction with marrow stimulation in autologous matrix-induced chondrogenesis, effectively fill joint defects and improve function, but it is currently unclear whether the resulting repair tissue recapitulates the properties of AC ,. Autologous chondrocyte implantation (ACI) involves chondrocyte isolation from cartilage in non-weight bearing areas, expansion ex vivo and re-implantation into the cartilage defect covered by a periosteal graft . In matrix-associated ACI (MACI), chondrocytes are implanted on three-dimensional porous scaffolds that facilitate three-dimensional repair tissue formation and defect filling . Positive outcomes have been reported at 7 to 13 years for knee lesions ,, and 2 to 5 years for ankle lesions ,. However, both techniques require two invasive surgical procedures . Low chondrocyte yield, loss of capacity to make hyaline cartilage-like extracellular matrix (ECM) due to chondrocyte de-differentiation, and chondrocyte senescence are concerns -. Transplantation of mesenchymal stem cells (MSCs) is a cell-based strategy that has the potential to resurface AC defects while avoiding the downsides of ACI/MACI. MSCs have an enhanced proliferative capacity and can be reproducibly differentiated into chondrocytes . Cell harvesting does not require an invasive procedure or wounding of AC at another site. The aim of this article is to provide a comprehensive review of MSC-based cartilage regeneration from bench to bedside and a discussion of the current technical considerations in MSC transplantation for treatment of traumatic, focal chondral and osteochondral defects. 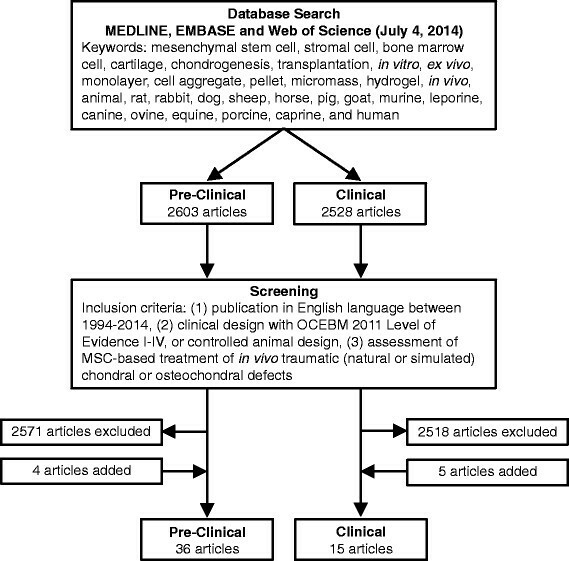 A comprehensive literature search was performed of MEDLINE, EMBASE and Web of Science databases to identify English articles published between 1994 and 2014 using various combinations of the following keywords: mesenchymal stem cell, stromal cell, bone marrow cell, cartilage, chondrogenesis, transplantation, in vitro, ex vivo, monolayer, cell aggregate, pellet, micromass, hydrogel, explant, in vivo, animal, rat, rabbit, dog, sheep, horse, pig, goat, murine, leporine, canine, ovine, equine, porcine, caprine, and human. Search steps performed within each database specifically for in vitro, in vivo animal and clinical literature are detailed in Additional file 1. Compilation of database outputs produced 6,137, 2,603 and 2,528 publications, respectively, for these searches. In vivo articles were then screened and included if they met the following criteria: (1) publication in English between 1994 and 2014; (2) clinical design with Oxford Centre for Evidence-Based Medicine 2011 level of evidence I to IV  or controlled animal design; and (3) assessment of MSC-based treatment of in vivo traumatic (natural or simulated), focal chondral or osteochondral defects. Relevant articles found within reference lists and within the journal Cartilage were also screened and considered for inclusion. This process yielded 36 pre-clinical in vivo animal studies, including 21 small animal and 15 large animal studies, and 15 clinical studies (Figure 1). Only key in vitro articles were included in our review as several hundred relevant articles were found within our initial search. Search strategy and selection of pre-clinical and clinical literature. MSC, mesenchymal stem cell; OCEBM, Oxford Centre for Evidence-Based Medicine. MSCs are spindle-shaped cells capable of rapid proliferation and self-renewal contained within a number of tissues, including bone marrow, synovial tissue, blood, adipose tissue, and periosteum ,,. Their multi-lineage potential allows for differentiation into a variety of cell types in order to create and repair mesenchymal tissues. MSCs have been differentiated into chondrogenic, osteogenic, and adipogenic pathways . Mediators capable of promoting MSC chondrogenesis, such as transforming growth factor-beta (TGF-β) and dexamethasone, have been elucidated using simplified in vitro models . MSC chondrogenesis can be induced within simple in vitro models consisting of cell monolayers or cell aggregates, pellets, micromasses, or transwell cultures containing multiple layers of cells and ECM ,-. High-density aggregation was achieved through the use of centrifugation and situates cells in a three-dimensional environment that fosters cellular interaction, mimicking cell condensation of mesenchymal cells during embryonic cartilage development and chondrogenic ECM formation ,. Alternatively, various biomaterials have been used as matrices on which MSCs are differentiated. MSCs embedded within collagen, agarose, alginate, chitosan and hyaluronic acid (HA) gels form aggregates of tissue that contain chondrocytes and cartilaginous ECM -. MSC-seeded porous scaffolds composed of collagen, HA, silk, decellularized cartilage ECM, polyglycolic acid (PGA), polylactic acid (PLA) and polylacticglycolic acid (PLGA) create tissue that histologically resembles hyaline cartilage -. Chondral and osteochondral explant models allow for cartilage repair tissue formation to be assessed within simulated defects in controlled in vitro environments. Porcine MSCs embedded in agarose gel implanted within chondral explants showed an abundance of type II collagen and glycosaminoglycan (GAG) matrix after 6 weeks of culture . Similarly, human MSCs embedded in alginate gel and implanted within osteochondral explants for 4 weeks had collagen II gene expression and GAG production consistent with hyaline cartilage . MSC-seeded gels displayed minimal integration with surrounding explant cartilage after 6 weeks of culture . This may be due, in part, to the absence of sufficient remodeling time or in vivo factors, such as mechanical stimulation, required for integration to occur . Animal models have provided pre-clinical in vivo assessment of MSCs in the treatment of AC defects. Starting with the work of Wakitani and colleagues in 1994 , MSC-based techniques have yielded positive outcomes in regenerating AC in several small animal studies involving rabbits - and rats ,. Various MSC injection and transplantation protocols have been used to treat simulated, focal chondral and osteochondral defects in large animals such as sheep, goats, pigs, and horses ,-. These large animal studies are summarized in Table 1. BM, bone marrow; BMDC, bone marrow-derived cell; GAG, glycosaminoglycan; HA, hyaluronic acid; ICRS, International Cartilage Repair Society; MACI, matrix-associated autologous chondrocyte implantation; MFX, microfracture; MOCART, Magnetic Resonance Observation of Cartilage Repair Tissue; MRI, magnetic resonance imaging; MSC, mesenchymal stem cell; OA, osteoarthritis; PGA, polyglycolic acid; PLA, polylactic acid; PLGA, polylactide co-glycolide; TCP, tricalcium phosphate; TEC, tissue-engineered construct; wk, week(s). Intra-articular injection of MSCs into rabbit knees containing femoral trochlea osteochondral defects led to resurfacing with fibrous tissue that failed to remodel into hyaline cartilage over 24 weeks . In contrast, MSCs implanted directly into the defect site produced cartilage-like tissue that remodeled with time to produce both cartilage and bone components similar to surrounding native osteochondral tissue. In another study, MSCs injected in conjunction with HA into porcine knees with partial-thickness chondral defects led to good defect coverage with hyaline-like cartilage at 12 weeks post-injection . HA alone produced minimal defect filling in this time frame. Other groups have performed MSC injection in association with subchondral drilling or microfracture ,,. Serial MSC injections performed weekly for 3 weeks after subchondral drilling for treatment of simulated chondral defects within the distal femur of goats produced integrated repair tissue consistent with hyaline cartilage after 6 months . In a similar model, Saw and colleagues  used bone marrow aspirate cell collections injected weekly with HA. They found improved content of proteoglycan and type II collagen within femoral trochlea chondral defects that received cell injection in comparison to those that received only HA. In contrast to these findings, McIlwraith and colleagues  found no difference between HA and an HA-MSC combination in several histologic parameters, magnetic resonance imaging (MRI) evaluation, and GAG quantity at 1 year in horses that received an injection and microfracture. Possible reasons for inconsistent outcomes include variation in the number of injections, length of follow-up and species. One potential drawback of intra-articular injection involves cell dispersion, associated lack of focus of injected contents into a defect site, and the potential for an insufficient amount of seeded cells required for regeneration. The use of magnetic labeling of cells and an external magnet has been proposed as a minimally invasive method to deliver injected MSCs to defects. In mini-pig knees, ferumoxide-labeled MSCs were directed over patella chondral lesions by magnet for 10 minutes following injection and produced superior arthroscopic and histologic scores to an injection directed by gravity . Various constructs for implantation have been proposed in the pre-clinical literature. A scaffold-free, three-dimensional tissue-engineered construct (TEC) derived from monolayers containing differentiated MSCs has been investigated ,. Over 6 months, TECs implanted within porcine femoral condyle chondral defects created repair tissue with a superficial fibrous layer and deep AC-like layer . Transplantation of MSC-seeded matrices composed of collagen, PLA, PGA, PLGA, polycaprolactone, fibrin, chitosan, alginate, silk, demineralized bone matrix, and tricalcium phosphate was successfully performed in several other small and large animal studies ,-,,,,,-,,,. Defect resurfacing with hyaline-like cartilage tissue was reported in the majority of cases at 4 to 24 weeks post-implantation with more integrated, mature tissue found at later time points. Some groups also noted the presence of bone regeneration within the osseous component of osteochondral defects ,,,,. Implantation of matrices seeded with MSCs that were precultivated in vitro for 2 to 3 weeks prior to implantation is an alternative protocol that has been assessed in three other studies ,,. Zscharnack and colleagues  showed that precultivated MSC-seeded collagen gels implanted within sheep osteochondral defects produced superior repair tissue to non-precultivated MSC-seeded gels based on International Cartilage Repair Society (ICRS) histologic scoring at 6 months post-implantation. Marquass and colleagues  had similar findings after 1 year and also showed that precultivated MSCs had better histologic outcomes than precultivated chondrocytes (MACI). Bone marrow nucleated cells - often described as bone marrow-derived cells (BMDCs) in the literature , - were seeded on collagen gels and compared with isolated, expanded MSCs by Zhang and colleagues . After 2 months, both cell types produced histologically and macroscopically equivalent hyaline-like cartilage repair tissue within porcine femoral trochlea chondral defects. Co-transplantation of chondrons and MSCs suspended within fibrin glue into goat femoral condyle chondral defects was assessed in another study . This technique showed superior defect filling, O’Driscoll histologic scoring and biochemical GAG quantity in comparison to microfracture. However, co-transplantation was not compared with MSC or chondrocyte transplantation alone. Animal studies have yielded positive pre-clinical results that have provided support and direction for MSC-based therapies in humans. Specific techniques such as MSC injection, and transplantation of both isolated MSCs and BMDCs have been taken into the clinical realm. Other techniques such as scaffold-free TEC, magnetically guided MSC injection, co-transplantation, and MSC precultivation have only been reported in the animal literature to date. A growing body of clinical evidence supports MSC implantation as an effective treatment for traumatic AC injury (Table 2). Cells derived from autologous bone marrow aspirates from the iliac crest have been used for treatment of focal, traumatic chondral and osteochondral defects of the femoral condyle -, femoral trochlea ,,, talus ,,, tibial plateau , and patella ,,. Other studies have addressed the use of this technique in managing other defect types, such as osteochondral lesions arising from osteochondritis dissecans ,, septic arthritis  and unicompartmental OA . ACI, autologous chondrocyte implantation; ACL-R, anterior cruciate ligament reconstruction; AOFAS, American Orthopaedic Foot and Ankle Society; BM, bone marrow; BMDC, bone marrow-derived cell; CMBMC, covered microfracture and bone marrow concentrate; CRA, Cartilage Repair Assessment (arthroscopy); F, female; GCSF, granulocyte colony stimulating factor; HA, hyaluronic acid; HTO, high tibial osteotomy; ICRS, International Cartilage Repair Society; IKDC, International Knee Documentation Committee; KOOS, Knee Injury and Osteoarthritis Outcome Score; M, male; MACI, matrix-associated autologous chondrocyte implantation; MFX, microfracture; MRI, magnetic resonance imaging; MSC, mesenchymal stem cell; OA, osteoarthritis; OCD, osteochondral dissecans; PGA-HA, polyglycolic acid-hyaluronic acid; RCT, randomized controlled trial; RHSSK, Revised Hospital for Special Surgery knee; SF-36, Short Form-36; VAS, Visual Analogue Scale; wk, week(s); y, year(s). Following aspiration, MSCs were isolated and expanded within the laboratory for 2 to 3 weeks and implanted alone , or in association with biomaterial matrices ,,,. Alternatively, in other studies, BMDCs - also described as bone marrow concentrate , or bone marrow aspirate concentrate  - were separated using centrifugation systems ,,,,-. Presumably, these collections contained a variety of cell types from the bone marrow space, some of which were MSCs. BMDCs were immediately implanted in conjunction with matrices into defects in the same operative period as the aspiration. Matrices used in these studies included platelet-rich fibrin gel ,,,,, fibrin glue ,, collagen gel and paste ,,,,, and scaffolds composed of collagen ,,,,, HA ,,-, and PGA-HA . In most cases, MSCs or BMDCs were seeded onto scaffold or gel matrices for implantation. Combinations of scaffolds and cell-containing gels or glue were commonly described -,-,-,. Some protocols involved the implantation of cells within gel followed by coverage with biomaterial membranes ,,. Cell-matrix constructs were implanted on the same day of scaffold seeding ,,-, or following a few days of in vitro culture in an attempt to promote cell adherence to scaffolds prior to implantation ,. Some groups used fibrin glue  and overlying periosteal flaps -,,, or synovium  to stabilize implanted constructs. Based on the available early evidence, implantation of MSCs or BMDC collections containing MSCs appears to be a successful treatment for focal traumatic chondral and osteochondral defects (Table 3). Clinical outcomes improved with time over 24 months following implantation in the majority of patients with focal chondral and osteochondral lesions of the knee ,- and ankle ,,. These positive outcomes contrast with those from patients with more advanced degenerative disease. In one study focusing on the management of unicompartmental OA of the knee, outcomes were equivalent between the MSC transplantation group and cell-free control group in 24 patients who underwent concomitant high tibial osteotomy . Furthermore, one participant with OA in another case series had worse clinical scores post-operatively than others with focal defects . AC, articular cartilage; BMDC, bone marrow-derived cell; GF, growth factor; MSC, mesenchymal stem cell. To date, there is a relative paucity of literature assessing clinical outcomes beyond 24 months in patients treated with MSC or BMDC transplantation for focal AC defects. One group reported outcomes up to 48 months and noted a slight decrease in American Orthopaedic Foot and Ankle Society (AOFAS) scores at both 36 and 48 months compared with 24 months post-implantation . Longer-term evidence is now available from Wakitani and colleagues  supporting the safety of MSC transplantation up to 137 months post-surgery, although other outcomes were not assessed. MRI and arthroscopy have shown that repair tissue derived from MSC and BMDC transplantation contains hyaline-like cartilage and integrates within surrounding native tissue within 24 months of implantation ,,-, (Table 2). Cartilage quality correlated with clinical outcomes , as did implant-defect congruity and the amount of defect filling . In some cases, hypertrophic cartilage has been noted on arthroscopy, but healthy repair tissue was found upon arthroscopic debridement of this tissue . Lack of complete filling and non-congruent resurfacing of defects have been reported in a minority of cases . In osteochondral lesions, subchondral bone appears to require longer periods of time than cartilage for remodeling. Giannini and colleagues  found abnormal subchondral structure and separated osteochondral interfaces on MRI at 24 months following treatment of osteochondral lesions of the talus. Histological analysis of repair tissue biopsies has been consistent with MRI and arthroscopic findings -,,, (Table 2). A number of groups have reported intense proteoglycan staining surrounding differentiated chondrocytes ,,,. Furthermore, repair tissue often contained a moderate to large amount of collagen II with lesser amounts of collagen I on immunohistochemistry that supported the presence of hyaline-like cartilage phenotype ,,,. Fibrocartilage or mixed repair tissue has also been described, but in a relatively smaller number of patients ,,. Periosteal flaps and subchondral drilling were used in these studies and are potential contributing factors. Two clinical studies have compared MSC/BMDC transplantation to chondrocyte transplantation (ACI/MACI) ,. Similar positive outcomes were noted on most clinical scales. Better physical role functioning on the ICRS Package Short Form-36 (SF-36) scale was noted with MSCs relative to chondrocytes . MRI, arthroscopic and histologic findings indicated that both procedures were capable of resurfacing defects with hyaline-like cartilage repair tissue that integrated into surrounding cartilage ,. Although implantation of MSC-based constructs has been the focus of clinical literature to date, one group has reported outcomes following intra-articular injection of MSCs for the treatment of focal chondral defects ,. In a randomized controlled trial, autologous peripheral blood MSCs were injected with HA weekly for 5 weeks after subchondral drilling and subsequently for another 3 weeks at 6 months into the knees of patients with lesions of the femoral condyle, tibial plateau, patella, and femoral trochlea. Histologic assessment at 18 months showed the presence of hyaline-like cartilage in patients who received MSCs. Furthermore, ICRS II histologic scores were significantly better in participants who received MSCs and HA versus those who received HA. However, International Knee Documentation Committee (IKDC) clinical scores were equivalent between these two groups at 24 months. The goal of MSC transplantation is to create repair tissue with properties of hyaline cartilage that integrates into surrounding native osteochondral tissue while limiting local and systemic adverse effects. Three general MSC transplantation protocols currently exist (Figure 2). The one-step BMDC transplantation protocol consists of bone marrow aspiration, separation of a nucleated cell population containing MSCs amongst other cells, seeding of these cells on a scaffold, and implantation all within a single operative period ,,-. A second protocol involves isolation of MSCs within the laboratory, in vitro expansion, and scaffold seeding shortly before implantation -,. The scaffold may be seeded at the time of implantation or within a few days after a short in vitro culture period to promote MSC adherence to the biomaterial . The final protocol utilizes isolated, expanded MSCs that are seeded onto a scaffold and precultivated - or pre-differentiated - in vitro over 2 to 3 weeks to promote chondrogenesis prior to implantation ,,. Mesenchymal stem cell transplantation constructs and protocols. (A) In bone marrow-derived cell (BMDC) transplantation, the bone marrow aspirate is centrifuged to create a BMDC concentrate that contains mesenchymal stem cells (MSCs) within a pool of other cells and chemical mediators. BMDCs are then seeded onto a scaffold and implanted within a cartilage defect. (B,C) MSC transplantation involves isolating MSCs from a bone marrow aspirate by plastic adherence and expansion in plastic tissue culture flasks. MSCs are then seeded onto a scaffold and implanted (B) or precultivated in vitro to promote chondrogenesis prior to implantation (C). BMDC transplantation and non-precultivated, isolated and expanded MSC transplantation have both resulted in the creation of hyaline-like cartilage based on arthroscopy, histology and imaging, and yielded positive outcomes in clinical studies ,-,-. To our knowledge, implantation of precultivated MSC-matrix constructs has not been studied clinically to date, but was shown to produce hyaline-like cartilage tissue in large animal in vivo studies ,,. Although successful resurfacing has been performed with all three transplantation protocols, each carries specific advantages and disadvantages that are described in Table 3. At present, studies comparing these protocols in humans are lacking, but have been performed in animal models. Zhang and colleagues  found no difference at 2 months between BMDCs and expanded MSCs seeded on collagen gels implanted within femoral trochlea chondral defects in mini-pigs. Marquass et al., showed that precultivated MSC-seeded collagen gels produced superior repair tissue after 1 year compared with non-precultivated MSCs within distal femur osteochondral defects in sheep. Regardless of the specific transplantation protocol used, MSC-based therapies require a number of steps that may be optimized to improve MSC yield, chondrogenesis, repair tissue integration, and ultimately clinical outcome. These steps may include cell collection, MSC isolation and expansion, matrix seeding, precultivation into cartilage tissue, and surgical implantation. MSCs are present within a number of tissues that may serve as potential harvest sites (Table 4). To date, needle aspiration of pelvic bone marrow has been the method of choice for MSC-based treatment of human AC defects ,,-,-,. The use of peripheral blood MSCs has also been reported clinically ,. Synovial, periosteal and adipose tissues are other sources that have been assessed in vivo in the animal literature with relevance ,,. Synovial MSCs appear to have improved chondrogenic capacity relative to MSCs from bone marrow and periosteum based on in vitro assessment , although this advantage has not been reproduced in vivo in two rabbit studies ,. Adipose tissue offers the advantage of abundant availability, but adipose MSCs have a lower chondrogenic potential than MSCs from bone marrow, synovium and periosteum . Bone marrow- and periosteum-derived MSCs have a heightened osteogenic potential . Although this may be not ideal for cartilage engineering, it could be advantageous in osseous regeneration within osteochondral lesions. While present-day techniques utilize autologous MSCs in transplantation, MSC tissue banking and allogeneic transplantation could one day provide an alternative strategy . However, further investigation is required to support allogeneic use of MSCs due to recent work suggesting that both undifferentiated and chondrogenic-differentiated MSCs cause immunoreaction . AC, articular cartilage; MSC, mesenchymal stem cell. Following bone marrow collection, tissue is placed in serum-containing medium within plastic culture flasks and incubated for a number of days . Mononucleated cells, some of which are MSCs, may be quantified and plated at 10,000 cells per cm2. MSC isolation occurs through adherence of MSCs to plastic, as other cell types are non-adherent and discarded when culture medium is changed. Cell replication is monitored through the level of confluence observed by microscopy. Once confluence is achieved, trypsin and EDTA are used to disrupt adherence, and MSCs are re-plated within a larger number of flasks . This process is repeated through multiple passages to allow for expansion to occur. Although a greater number of passages yields a larger number of total MSCs available for implantation, proliferation and chondrogenic differentiation potential decrease and may be lost if cells are expanded through too many passages ,. These cells are then destined to undergo osteogenesis . As a result, MSCs are usually expanded through a maximum of two to three passages. Given that the ratio of MSCs to other cells within the bone marrow is estimated at one in 10,000 cells, expansion is beneficial and must be optimized to ensure that an adequate yield of pure MSCs is available for implantation . Basic fibroblast growth factor (FGF-2 or bFGF) within culture medium increases MSC growth rate and maintains multipotency . Furthermore, FGF-2 has been shown to increase collagen and proteoglycan gene expression and GAG production ,. Hypoxia during MSC expansion also augments chondrogenic potential . GAG synthesis and gene expression of collagen II and Sry-related HMG box (SOX)9 significantly increased in MSC pellet cultures expanded under 3% O2 compared with those expanded under 21% O2. Bioreactors may also be used to improve yield; these provide efficient nutrient exchange and allow for increased cell densities during expansion . Biomaterial matrices provide a framework for MSC proliferation and differentiation, and consolidate MSCs into three-dimensional structures capable of filling defects. The vast majority of pre-clinical and clinical studies to date have used matrices. Gels or pastes composed of collagen or platelet-rich fibrin are moldable substances that hold the cells suspended ,. Porous scaffolds made of materials such as collagen and HA serve as malleable, foam-like structures that adhere MSCs at the time of seeding ,. Cell-seeded scaffolds with multiple layers engineered for osteochondral lesions have shown positive results in animal studies . A tri-layer scaffold composed of collagen and hydroxyapatite has been tested in humans, but was used as a cell-free scaffold without co-implantation of MSCs . There is potential for use of this product in conjunction with MSCs in the future. Combinations of MSC-embedded gels and scaffolds have been used in some in vivo studies ,,,. MSC seeding density has not been routinely reported to date in clinical studies. One reason for this is that some trials have used BMDCs, only a few of which are MSCs, rather than pure isolated MSCs . In the in vivo animal literature, MSC densities of 10 to 48 million cells per cm3 of scaffold have been used ,,. The optimal number of MSCs to be seeded per unit volume is currently unknown. Standard open or arthroscopic surgical approaches to the knee or ankle are used to access chondral and osteochondral defects during implantation procedures ,,,. Damaged AC is debrided down to subchondral bone and the edges are trimmed until a rim of healthy AC is evident ,,. In the setting of full-thickness chondral defects, drilling of intact subchondral bone has been used by some groups in an attempt to stimulate the influx of cells and mediators into the repair zone ,-,, while other groups have left subchondral bone intact ,,. Subchondral bone is already disrupted in osteochondral lesions. Therefore, careful debridement of malacic bone may be performed until healthy bone is reached . At the time of implantation, matrices or cell-matrix constructs may be resized with punches or scalpels to fit within the margins of the defect . Implantation orientation may be relevant in scaffolds engineered with separate porous and non-porous sides ,. Fibrin glue or autologous platelet-rich fibrin gel may be deposited within the defect and overlying the MSC-matrix construct to augment implant fixation ,,,. Sutures may be used to anchor cell-seeded scaffolds to surrounding native cartilage . Autologous periosteal flaps or biomaterial membranes have also been used to prevent leakage of MSCs from cell collections implanted alone , or embedded within collagen or fibrin gel ,,,,. Periosteal flaps have been shown to form superficial fibrous caps that cover hyaline cartilage repair tissue . In general, they are not recommended for use in scaffold-associated cell-based therapies, but may be used to contain implanted MSCs within defect areas when scaffolds are not used . Various in vitro culture techniques have been elucidated that may be used to promote the creation of hyaline cartilage within precultivated MSC-scaffold constructs. Chemical mediators such as TGF-β and dexamethasone are placed with culture media for chondrogenic induction . Several factors, including bone morphogenetic proteins (BMP-2, -4 and -6) and insulin-like growth factor (IGF)-1 may be used in addition to TGF-β and dexamethasone to amplify chondrogenesis ,. Ascorbic acid serves as a cofactor in the hydroxylation of amino acids in collagen, and is also routinely used within chondrogenic culture medium . Incubator oxygen tension during precultivation may be used to modulate chondrogenesis. Hypoxic exposure was found to increase ECM deposition on scaffolds and gene expression of collagen II, aggrecan and Sox9 in pellet cultures . Co-culture of MSCs with chondrocytes promotes the creation of cartilage through chondrocyte-enhanced MSC chondrogenesis . Pellet co-culture of human MSCs and chondrocytes increased GAG deposition and expression of type II collagen while enhancing MSC-induced chondrocyte proliferation . Cartilage formation may be augmented by mechanical stimulation during cultivation through either hydrostatic pressure or ultrasound. Hydrostatic pressure in constant and cyclic forms increased sulfated GAG matrix deposition by chondrocytes cultured on collagen scaffolds . Furthermore, low-intensity ultrasound improved histological chondrogenic morphology, GAG and collagen II content, as well as gene expression of type II collagen, aggrecan and SOX9 ,. Bone marrow-derived MSCs have the propensity to enter an osteogenic pathway, a property that is not ideal for AC engineering . During precultivation, osteogenesis may be dampened using a variety of methods. Parathyroid hormone-related protein has been shown to reduce collagen X gene expression and alkaline phosphatase activity . Hypoxic culture of MSCs significantly suppressed expression of collagen X relative to normoxic culture . Lastly, co-culture of MSCs with chondrocytes reduced osteogenesis based on osteocalcin quantification, and Von Kossa and Alizarin Red staining . MSC-based therapy through injection or implantation is a promising treatment for traumatic chondral and osteochondral defects. MSC injection offers the advantage of minimal invasiveness, but dispersion of injected MSCs and lack of focus of these cells into defects make this method less appealing than direct implantation techniques. Several pre-clinical studies have been performed, but only one group has assessed MSC injection clinically to date . The current literature supports performing microfracture or subchondral drilling in conjunction with weekly injections of MSCs and HA over the course of multiple weeks ,,. This protocol presumably increases the likelihood of defect seeding with MSCs from both injection and subchondral marrow sources. MSCs may be implanted alone or in conjunction with a biomaterial matrix. MSCs implanted and covered with a periosteal flap in a procedure analogous to ACI produced good outcomes based on one clinical study . The majority of the current clinical and pre-clinical literature has focused on matrix-associated transplantation of MSCs. 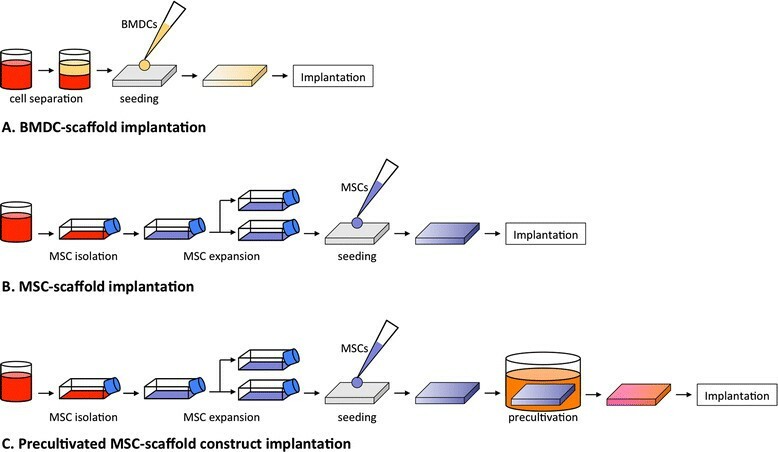 Three general construct types have been implanted, including biomaterial scaffolds seeded with either BMDCs  or isolated and expanded MSCs , and precultivated constructs derived from MSCs cultured in vitro on scaffolds prior to implantation . All three protocols are capable of resurfacing focal AC defects with hyaline-like cartilage that integrates with surrounding tissue ,,, while each has unique advantages and disadvantages. At present, all may be considered as potential treatment options. BMDC-scaffold implantation and non-precultivated isolated, expanded MSC-scaffold implantation have led to positive functional, arthroscopic, histologic and radiographic outcomes at 12 to 48 months in patients with traumatic, focal chondral and osteochondral defects of the knee and ankle -,,. No clinical studies have compared these two protocols, although one preclinical study found equivalent histologic outcomes . The third protocol, precultivated MSC-scaffold construct implantation, has only been investigated in pre-clinical models but should be considered for clinical implementation given that it produced superior repair tissue in comparison to non-precultivated MSC-scaffold constructs over 6 to 12 months in two sheep studies ,. It is currently unclear whether defect characteristics should dictate the transplantation protocol used. Both full-thickness chondral and osteochondral defects have been treated successfully with the current modalities, but several important differences exist between these defect types. In the setting of full-thickness chondral lesions, the subchondral bone is intact and there is no diffusion of subchondral marrow contents (MSCs, accessory cells and growth factors) into the defect site. Some groups have therefore recommended bone marrow stimulation techniques, such as microfracture and subchondral drilling, to be performed as an adjunct to MSC/BMDC-scaffold implantation ,. However, other groups have not used these techniques ,,,,, possibly because the repair tissue derived from microfracture or subchondral drilling may produce fibrocartilage that is mechanically inferior to hyaline cartilage . However, histologic assessment following combined arthroscopic microfracture and BMDC transplantation - described as the covered microfracture and bone marrow concentrate technique by Gigante and colleagues , - showed the presence of hyaline-like cartilage tissue. Osteochondral defects are deeper defects that involve subchondral plate disruption and diffusion of subchondral marrow contents into the defect site. These defects require more complex regeneration of separate layers of cartilage and bone. Tissue consistent with hyaline cartilage has been found following MSC transplantation ,,. Subchondral bone regeneration has also been reported, but restoration requires an extended period of time relative to cartilage. Specifically, 29 months following treatment of femoral condyle osteochondral defects, Buda and colleagues  noted cartilage surface intactness in 70%, iso-intense cartilage tissue in 65%, but subchondral lamina and bone intactness in only 30% of participants on MRI. Similarly, at 24 months following treatment of talus osteochondral defects, Giannini and colleagues  reported cartilage surface intactness in 40%, iso-intense cartilage tissue in 70%, but subchondral lamina and bone intactness in only 10% and 35%, respectively. Detailed comparisons between MSC transplantation and other modalities of treatment for traumatic AC defects are lacking in the current literature. Chondrocyte transplantation (ACI/MACI), the current gold standard of cell-based treatment, has shown positive outcomes up to 10 to 20 years , while MSC/BMDC transplantation has only been assessed for up to 2 to 4 years. In our review, one pre-clinical large animal study and two clinical studies were found that directly compared MSC transplantation to chondrocyte transplantation ,,. Marquass and colleagues  reported superior histologic findings in repair tissue derived from precultivated MSCs in comparison to chondrocytes at 1 year post-implantation in sheep. Clinically, Nejadnik and colleagues  found similar positive functional outcomes on IKDC, Tegner and Lysholm scales between MSC implantation and ACI in the treatment of knee defects, but noted significantly higher physical role functioning on the ICRS Package SF-36 in patients treated with MSCs. Giannini and colleagues reported similarly improved AOFAS scores with both MSC and chondrocyte transplantation following treatment of talus defects . Further comparative evaluation is required to better assess MSC transplantation relative to chondrocyte implantation. MSC transplantation may reduce the likelihood of low chondrocyte yield and chondrocyte de-differentiation associated with chondrocyte transplantation ,,. Chondrocyte senescence is a concern with ACI/MACI ,,, and, although MSCs also undergo senescence over prolonged periods of proliferation, adequate MSC yields for transplantation may be attained at a stage during which there is still significant residual proliferative capacity . Chondrocyte transplantation requires two invasive surgical procedures, one for cell collection and one for implantation . In contrast, MSC transplantation only requires one surgical procedure at the time of implantation . MSC collection may be performed through minimally invasive needle aspiration . Consequently, MSC transplantation may be less expensive than ACI/MACI. Giannini and colleagues  found that the total cost of arthroscopic matrix-associated BMDC transplantation was half of the cost of arthroscopic MACI and one-third of the cost of open ACI. Several technical steps may be optimized in MSC transplantation to promote cell numbers, chondrogenesis, repair tissue integration, and clinical outcome. With respect to cell collection, autologous bone marrow has been used in all clinical studies to date and is the current preference -,-. However, synovial MSCs appear to have superior chondrogenic capacity and should be considered . Furthermore, adipose tissue is abundantly available . In MSC isolation, plastic adherence is used . Expansion may be augmented using serum-containing medium supplemented with FGF-2 and incubation under hypoxic conditions ,. Several matrix types are appropriate for MSC transplantation. At present, three-dimensional scaffolds composed of collagen or hyaluronic acid are the standard ,. Scaffolds composed of multiple layers are an option in the setting of osteochondral lesions . Precultivation of MSC-scaffold constructs should be performed in serum-free medium containing TGF-β and dexamethasone supplemented with other mediators such as ascorbic acid, IGF-1 or BMPs ,,. Hypoxic incubation, co-culture with chondrocytes, mechanical stimulation with ultrasound, and dynamic culture within a bioreactor are other precultivation optimizing techniques that should be considered ,,,. Implantation may be performed through either open or arthroscopic techniques. Fibrin glue or autologous platelet-rich fibrin gel may be used to stabilize implanted constructs ,. At present, there is insufficient evidence to support the use of marrow stimulation (that is, subchondral drilling or microfracture) or periosteal flaps in MSC transplantation. MSC transplantation is a promising cell-based strategy for the treatment of traumatic chondral and osteochondral defects of the knee and ankle. Although there is currently no established consensus protocol, multiple technical variations have successfully produced hyaline-like cartilage repair tissue that integrates within native tissue. Duplication and optimization of current protocols are important to improve the cartilage ECM formed in a reliable and safe manner. Clinical studies to date report positive outcomes at 12 to 48 months following MSC implantation. Future investigation will provide insight into long-term outcomes relative to other treatment modalities and clarify whether MSC transplantation may replace present-day techniques as the gold standard. We would like to thank Mr Dale Storie from John W Scott Health Sciences Library at the University of Alberta for his contribution to the development of a literature search strategy for this review.